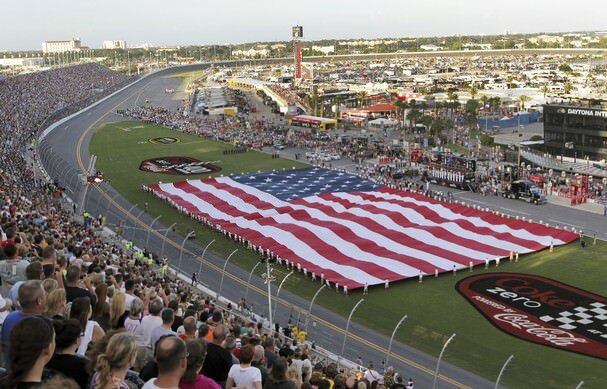 DAYTONA BEACH, Fla. (Oct. 16, 2010) – The National Association for Stock Car Auto Racing (NASCAR) today announced it will race with E15 fuel in its three national touring series in 2011. Sunoco Green E15 is a 15 percent ethanol blend using American-made ethanol from corn grown by American farmers. “NASCAR is committed to being an environmental leader, and the sport has taken significant steps over the years toward conservation by introducing measurable, best-in-class initiatives in recycling, alternative energy, and carbon mitigation,” said Brian France, Chairman and Chief Executive Officer of NASCAR. Sunoco Green E15 will be blended at Sunoco’s fuel facility in Marcus Hook, Pa., which provides high-performance race fuel to NASCAR teams at no cost to them. The American-grown and American-made corn ethanol will come in part from Sunoco’s new ethanol plant in Fulton, N.Y. The new fuel will be pumped directly from tankers at the track, rather than from on-site underground storage tanks. NASCAR team engine builders have been testing the Sunoco Green E15 for several months, and reports have been very positive. In fact, many have reported achieving more horsepower with Sunoco Green E15. Sunoco Green E15 is the latest in a series of NASCAR conservation initiatives. With the input of environmental experts and motorsports industry constituents, NASCAR is implementing programs to protect the environment while providing a proving ground for new green technologies. Drivers, teams, and track operators are working diligently on the issue of recycling, land conservation, and adopting alternative energy sources. Sponsors such as Coca-Cola, Coors Light, Goodyear, Office Depot, Safety-Kleen, Sprint and UPS are setting benchmarks for their dedication to keeping NASCAR green. NASCAR Green Clean Air: A unique program that plants ten trees for each green flag that drops during NASCAR Sprint Cup Series races, capturing 100 percent of the carbon produced by the on-track racing at the events. Largest recycling program in sports: All tires, oils, fluids and batteries used in NASCAR racing are recaptured and recycled. Additionally, NASCAR’s leading event recycling program has expanded in 2010, with Coors Light, Office Depot and UPS joining NASCAR and Coca-Cola Recycling. It is anticipated approximately 100 tons of material (including over three million containers) from NASCAR race tracks will be diverted from landfills and recycled next year. World’s largest solar powered sports facility: The NASCAR industry is taking a leadership position in alternative energy, represented in the Pocono Raceway solar farm, which at three megawatts is the world’s biggest solar-powered sports facility, providing all the energy for the track, in addition to approximately 1,000 area homes. The National Association for Stock Car Auto Racing (NASCAR) is the sanctioning body for one of North America’s premier sports. NASCAR is the No. 1 spectator sport – with more of the top 20 highest attended sporting events in the U.S. than any other sport, and is the No. 2-rated regular-season sport on television. 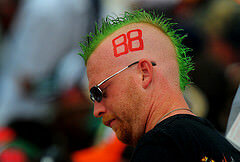 NASCAR races are broadcast in more than 150 countries and in 20 languages. NASCAR fans are the most brand loyal in all of sports, and as a result more Fortune 500 companies participate in NASCAR than any other sport. NASCAR consists of three national series (the NASCAR Sprint Cup Series, NASCAR Nationwide Series, and NASCAR Camping World Truck Series), four regional series, and one local grassroots series, as well as two international series. Also part of NASCAR is GRAND-AM Road Racing, known for its competition on road courses with multiple classes of cars. NASCAR sanctions more than 1,200 races at 100 tracks in more than 30 U.S. states, Canada and Mexico. Based in Daytona Beach (Fla.), NASCAR has offices in New York, Los Angeles, Charlotte (N.C.), Concord (N.C.), Conover (N.C.), Bentonville (Ark. ), Mexico City, and Toronto. Sunoco is one of the world’s largest manufacturers of racing gasoline, distributing fuel to more than 400 race tracks and over 40 other race sanctions in the U.S. With a reputation for the best racing gasoline and a proven distribution network, Sunoco became the official fuel of NASCAR in 2004. Today, every car and truck in the NASCAR Sprint Cup Series, NASCAR Nationwide Series, and NASCAR Camping World Truck Series uses Sunoco racing fuel exclusively and displays the Sunoco logo on both front quarter panels. The Sunoco diamond marks the entrance and exit areas of pit row, and appears on the drivers’ uniforms, fuel cans, and team cars and trucks. 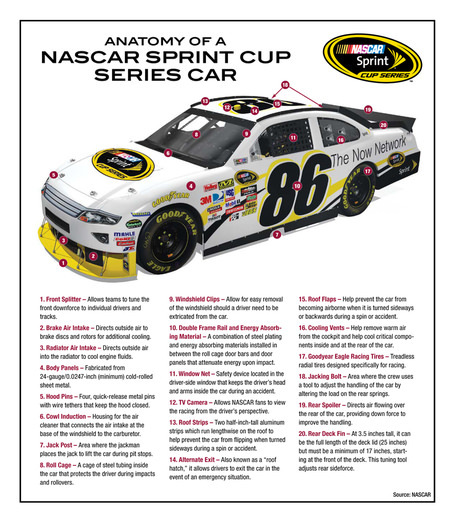 With over 4,700 retail locations, Sunoco provides NASCAR with the opportunity for marketing and cross-promotions.